Generalkidd has contributed to 8 posts out of 468602 total posts (0.00%) in 499 days (.02 posts per day). I'm using Sapien for the first time and I'm practicing with the Example map included. I just want to place new objects into the scene like new weapons, etc. But I can't do that. I can't add tags either to the palette and all the options in the property window are totally greyed out too. I'm only able to select existing weapons on the map and replace them with another weapon. But that's it. Beyond that, nothing is available to me. I tried enabling expert mode too but still nothing. Did I forgot to do something or is there an issue with Sapien? Edit: Nevermind, apparently when I installed the map editor, it made all the files read only in the file attributes for some reason, so all I had to do was uncheck the read only box for all the files. What would you recommend I use then? There's nothing simpler for the PC version? I've never used the HEK before and I was hoping to spawn that marine I could just do a projectile swap or something simple along those lines. What would you recommend I use then? I'm not too familiar with many other Halo PC modding tools. When placing a biped theres a spot for "desired permutation". How do I do that? The modding tools and editors I've used don't have that option it seems. I'm using HHT and Eschaton and I don't see the option to change the permutation in the bipeds. I looked into SparkEdit but I have no idea how to use that or if that's even the right tool for this. Even within the scope of Halo: Custom Edition I do not know of anyway to modify the scripts of a map while it is running. So I am fairly sure to say that tools probably don't exist for regular Halo: PC or other Halo games. The only way to modify scripts in Halo: Custom Edition that I know of is to decompile the map, extract the scripts and edit them, then recompile the map and restart Halo: CE. It's not the answer you want to hear, but the only one I know. Hmm alright and I assume there's no other way to modify a cutscene? All I'm looking to do is make the final cutscene skippable. That's just a scenery model. It's not a biped that can stand up on it's own and do anything. Though somebody might have turned it into a biped and uploaded it so search around. Nah I'm not karia007. Also I'm pretty sure the marine isn't a scenery object. 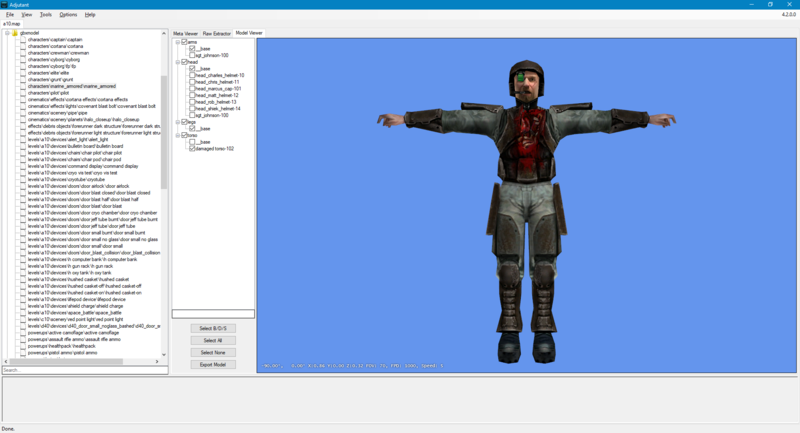 For example, that mangled elite, it's in characters/elite/elite_corpse as a separate model but the marine's torso isn't. It's stored in A10.map the same way the various faces are, however, I don't know how to get a certain face (and in this case torso) to spawn in. I'm trying to spawn the marine with gutted torso in Halo CE. It's in the campaign missions on a couple missions, it's basically the marine version of the Elite with the gutted torso on the mission 343 Guilty Spark. I don't know how to spawn that specific variation of the marine though. I don't need it to have AI or anything. Just simply spawning it like shooting a biped out of a pistol would do. I'm trying to do a very simple mod for the last level of Halo, The Maw. I want to make the final cutscene skippable but it seems like the only way to do that is through script editing. Are there any tools out there that would let me edit the scripts without using Custom Edition? I've tried HHT and Eschaton but none of them let me edit the scripts. Or if anyone knows another way to skip the final cutscene on the Maw that'd work too. The reason why I don't want to use any Custom Edition tools is because I'm actually doing this on the Halo Anniversary version of the map. Halo PC modding tools actually work on Halo Anniversary maps for the most part which is why I'm hoping there's a script editor out there that works for just the campaign maps and doesn't need Custom Edition. Time: Thu April 18, 2019 9:25 PM 172 ms.